Disclosed is a battery, comprising a positive electrode, a negative electrode and electrolyte solution. The positive electrode comprises a positive electrode active substance; the positive electrode active substance can reversibly deintercalate and intercalate an ion; the negative electrode comprises at least a negative electrode current collector not involving in an electrochemical reaction; the electrolyte solution comprises at least one solvent capable of dissolving and ionizing an electrolyte; the electrolyte is capable of ionizing out at least an active ion that undergoes reduction-deposition and oxidation-dissolution on the negative electrode in the process of charging and discharging and/or at least one ion capable of being reversibly deintercalated and intercalated on the positive electrode in the process of charging and discharging. The negative electrode also comprises a negative electrode active substance formed on the surface of the negative electrode current collector; the negative electrode active substance is capable of being oxidized-dissolved into the active ion in the process of discharging. The battery of the present invention is safe to operate, with a low production cost, an excellent cycling property and a long service life, and is suitable to be used as an energy storage system in the field of large-scale energy storage and as a substitute for lead acid battery. The present invention belongs to the field of electrochemical energy storage, particularly relates to a battery. Extensive use of new human energy, leading to a rapid expansion of the secondary battery market. The current new energy system requirements for secondary batteries everywhere. Whether electric vehicles, wind, solar or grid power peaking, are in urgent need of a cheap, reliable, secure and long-life of the secondary battery. The secondary battery currently focused on the development of a lithium ion battery, a sodium u temperature battery, a nickel chloride battery and a sodium vanadium redox flow battery. These cells have their own advantages, such as high temperature sodium and lithium ion batteries u long battery life and the energy density, it is theoretically vanadium redox flow battery includes unlimited life. But no matter what kind of battery, it can not meet the low-cost, reliable, safe and long life requirements. Conventional lithium-ion batteries are too expensive, and there are safety hazards; high temperature sodium-sulfur battery manufacturing technology threshold, the sale price; vanadium redox flow battery failed a number of technical bottleneck breakthrough like. Many researchers are dedicated to this purpose aqueous lithium-ion battery research, hoping to significantly reduce the cost of lithium-ion battery and increased security, and made a number of oxides LiMn 2 0 4 is positive, such as vanadium LiV 3 0 8 as the negative electrode, a battery electrolyte water, but poor stability in water of such a negative charge and discharge, and vanadium have a certain toxicity, which limits the development of such batteries. Up to now, the structure of aqueous lithium ion secondary batteries have been proposed are not out of lithium ions coming out on - the principles of the embedded structure, have been reported such as V0 2 / LiMn 2 0 4, LiV 3 O 8 / LiNi 0 81. Co 0. 19 O 2, TiP 2 0 7 / LiMn 2 0 4, LiTi 2 (P0 4) 3 / LiMn 2 0 4, LiV 3 0 8 / LiCo0 2 and the like. The present invention aims to provide a low-cost, reliable and excellent in battery performance. A battery comprising a positive electrode, a negative electrode, an electrolyte, said positive electrode comprising a positive electrode active material, the positive active material capable of reversibly prolapse - ion embedded; said negative electrode includes at least a negative electrode current collector is not involved in the electrochemical reaction; the electrolysis comprising at least one liquid capable of dissolving the electrolyte and electrolyte solvent is ionized; the electrolyte capable of ionizing the at least one reducing charge and discharge occur in the negative electrode - deposition and oxidation - dissolved active ions or / and at least one kinds of charge-discharge process in the positive electrode can reversibly prolapse - ion embedded; said negative electrode further comprises a negative electrode formed on the collector surface active material, the anode active material capable of being oxidized during discharge - that is dissolved said active ion. Preferably, the negative electrode active material formed on the negative electrode current collector by coating, plating or sputtering. Preferably, the negative active material includes elemental metal, the metal is selected from Zn, Fe, Cr, Cu, Mn, Ni least one. Preferably, the negative electrode current collector material is selected from metals Ni, Cu, Ag, Pb, Sn, Fe, Al or one of the metal through the passivation treated. Preferably, the material of the negative electrode current collector is selected from carbon-based materials, stainless steel, silicon or a metal having plating / coating, said coating / layer containing elemental C, Sn, In, Ag, Pb, Co, an alloy or at least one oxide. Preferably, the coating / thickness of the coating of the l - between 1000nm. Preferably, the anode further comprising a porous layer formed on a surface of the negative electrode current collector, a porous layer having micron or submicron or nano-sized pores. Preferably, the porous layer comprises a carbon-based material, the carbon-based material is selected from Ketjen black, active carbon, carbon nanotubes, carbon fiber, at least one of graphite. Preferably, the porous layer comprises a carbon-based material, the carbon-based material is a mixture of activated carbon powder and a binder, the percentage by weight of activated carbon powder of the porous layer range from 20 to 99%. Preferably, the negative electrode further comprises a negative electrode formed on the surface of the graphene layer of the current collector. Preferably, the copper negative electrode current collector, the negative active material is zinc. Preferably, the negative electrode active material formed on the surface of the anode current collector through the pre-treatment, pre-treatment is selected from mechanical treatment of the surface, at least one chemical or electrochemical treatment. Preferably, the electrolytic solution pH in the range 3-7. Preferably, the active ions are present in the electrolyte to form at least one perchlorate, sulfates, nitrates, acetates, formates, phosphates. Preferably, the positive electrode active material capable of reversibly prolapse - lithium ions, sodium ions, magnesium ions or zinc ions. Preferably, the positive electrode current collector material is selected from graphite, stainless steel, aluminum, stainless steel or passivated aluminum. The present invention also provides a battery comprising a cathode, an anode, an electrolyte, said positive electrode comprising a positive electrode active material, the positive active material capable of reversibly prolapse - ion embedded; said negative electrode active material involved in the electrochemical reactions comprising; the electrolyte comprises at least one electrolyte capable of dissolving the electrolyte and a solvent ionization; electrolyte capable of ionizing the at least one of the positive electrode capable of reversibly emerge at - ion embedded; the positive active material does not include the said reversible prolapse - ion embedded; first operation of the battery is the reversible prolapse - ion embedded embedding the positive active material, the negative active material oxide - discharge process for the dissolution of the active ion. The present invention also provides a battery comprising a cathode, an anode, an electrolyte, said positive electrode comprising a positive electrode active material, the positive active material capable of reversibly prolapse - ion embedded; said negative electrode active material involved in the electrochemical reactions comprising; the electrolyte comprises at least one solvent capable of dissolving the electrolyte and the electrolyte ionized; said at least one electrolyte capable of ionizing a reduction occurs in the negative electrode - active ion deposition can take place and at least one of the positive electrode reversible prolapse - ion embedded; the positive active material capable of reversibly embedded in the extrusion and extrusion - ion embedded; first operation of the battery is the positive electrode active material in the reversible prolapse prolapse - ions embedded, the reactive ion reduction - deposited as the negative electrode active material during charging of the reversible or prolapse - ions embedded in the embedded positive electrode active material, the negative active material oxide - discharge process for the dissolution of the active ion. Preferably, the battery is the first positive electrode active material working the reversible prolapse prolapse - ion embedded, the active ions are reduced - deposited as the negative electrode active material during charging. The present invention also provides a battery comprising a cathode, an anode, an electrolyte, said positive electrode comprising a positive electrode active material, the positive active material capable of reversibly prolapse - ion embedded; said negative electrode active material involved in the electrochemical reactions comprising; the electrolyte comprises at least one electrolyte capable of dissolving the solvent and the electrolyte ionized; the electrolyte capable of ionizing the at least one of the positive electrode capable of reversibly prolapse - ion embedded; the positive active material capable of extrusion and embedding the reversible prolapse - ion embedded; first operation of the battery is the reversible prolapse - ions embedded in the embedded positive electrode active material, the negative active material oxide - discharge process for the dissolution of the active ion. The present invention also provides a battery comprising a cathode, an anode, an electrolyte, said positive electrode comprising a positive electrode active material, the positive active material capable of reversibly prolapse - ion embedded; said negative electrode active material involved in the electrochemical reactions comprising; the electrolyte comprises at least one solvent capable of dissolving the electrolyte and the electrolyte ionized; said at least one electrolyte capable of ionizing a reduction occurs in the negative electrode - active ion deposition; the positive active material and can be fitted prolapse the reversible prolapse - ion embedded; first operation of the battery is the positive electrode active material in the reversible prolapse prolapse - embedded ions, the negative ions of the active reduction - deposited as the negative electrode active material the charging process. The present invention also provides a battery comprising a cathode, an anode, an electrolyte, said positive electrode comprising a positive electrode active material, the positive active material capable of reversibly prolapse - ion embedded; said negative electrode active material involved in the electrochemical reactions comprising; the electrolyte comprises at least one solvent capable of dissolving the electrolyte and the electrolyte ionized; said at least one electrolyte capable of ionizing a reduction occurs in the negative electrode - active ion deposition; the positive electrode active material in the reversible prolapse - ions embedded in a saturation state; first operation of the battery is the positive electrode active material in the reversible prolapse prolapse - ion embedded, the active ions are deposited as reducing the negative electrode active material of the negative electrode charge process. The present invention also provides a battery comprising a cathode, an anode, an electrolyte, said positive electrode comprising a positive electrode active material, the positive active material capable of reversibly prolapse - ion embedded; said negative electrode active material involved in the electrochemical reactions comprising; the electrolyte comprises at least one solvent capable of dissolving the electrolyte and the electrolyte ionized; said at least one electrolyte capable of ionizing a reduction occurs in the negative electrode - active ion deposition; the positive electrode active material in the reversible prolapse - ions embedded in a supersaturated state, the positive electrode active material surface modified or coated with a metal or metal oxide; first operation of the cell is reversible cathode active material of the extrusion of the extrusion - ion embedded the reduction of the negative electrode active ion - deposited as the negative electrode active material during charging. Preferably, the metal is aluminum, the metal oxide is alumina. A battery of the present invention provides safe operation, low production cost, high performance and long life cycle, while the battery having a first plurality of work modes, user-selected according to their needs, the present invention is suitable as a large energy storage battery art energy storage systems and alternatives to lead-acid batteries. The present invention also provides a battery including a positive electrode, a negative electrode and an electrolyte, said positive electrode comprising a positive electrode current collector and the positive electrode active material participating in the electrochemical reaction of the positive electrode active material capable of reversibly prolapse - ion embedded; the least negative a negative electrode comprising a current collector; the electrolyte comprises at least one solvent capable of dissolving the electrolyte and the electrolyte ionized; the electrolyte capable of ionizing the at least one reducing charge and discharge occur in the negative electrode - deposition and oxidation - dissolving reactive ion; the positive electrode current collector material is selected from carbon-based material, one or more metal alloys. Preferably, the carbon-based material is selected from glassy carbon, graphite, carbon foam, carbon felt, a carbon fiber. Preferably, the metal is selected from Al, Fe, Cu, Pb, Ti, Cr, Mo, Co, Ag or one of the metal through the passivation treated. Preferably, the alloy selected from stainless steel, aluminum, Ni alloy, Ti alloy, Cu alloy, Co alloys, Ti-Pt alloys, Pt-Rh or an alloy of the alloy through the passivation treated. Preferably, the negative electrode current collector material is selected from metals Ni, Cu, Ag, Pb, Sn, Fe, Al or one of the metal through the passivation treated. Preferably, the material of the negative electrode current collector is selected from carbon-based materials, stainless steel, or silicon having a plating / coating metal, the plating / coating contains C, Sn, In, Ag, Pb, Co, Zn elemental , an alloy, or an oxide of at least one. Preferably, the active ions include metal ions, the metal is selected from Zn, Fe, Cr, Cu, Mn, Ni least one. Preferably, the metal ions present in the electrolyte to form at least one perchlorate, sulfates, nitrates, acetates, formates, phosphates. The present invention also provides a battery including a positive electrode, a negative electrode and an electrolyte, said positive electrode comprising a positive electrode current collector and the positive electrode active material participating in the electrochemical reaction of the positive electrode active material capable of reversibly prolapse - ion embedded; the least negative a negative electrode comprising a current collector; the electrolyte comprises at least one solvent capable of dissolving the electrolyte and the electrolyte ionized; the electrolyte capable of ionizing the at least one reducing charge and discharge occur in the negative electrode - deposition and oxidation - dissolving reactive ion; the positive electrode current collector material is selected from stainless steel, aluminum, stainless steel or aluminum after one kind of passivation in. Preferably, the aluminum alloy type 6000 series aluminum alloy. Preferably, the stainless steel type 300 series stainless steel. Preferably, the negative electrode further comprises a negative electrode active material, the anode active material capable of oxidizing in the battery discharge process - dissolution of the active ion. The present invention also provides a battery comprising a cathode, an anode, an electrolyte, said positive electrode comprising a positive electrode active material, the positive active material capable of reversibly prolapse - ion embedded; said negative electrode active material involved in the electrochemical reactions comprising; the electrolyte comprises at least one electrolyte capable of dissolving the electrolyte and the ionization solvent; said at least one electrolyte capable of ionizing the discharge process of the negative reduction takes place - deposition and oxidation - ions or dissolved active / and at least one charge-discharge process in the positive electrode can reversibly prolapse - embedded ions, the negative electrode active material capable of being oxidized during discharge - dissolving said active ion; the cathode current collector comprises a material selected from carbon based material, a metal or an alloy thereof. The present invention also provides a battery including a positive electrode, a negative electrode, a separator and an electrolyte, said positive electrode comprising a positive electrode current collector and the positive electrode active material participating in the electrochemical reaction of the positive electrode active material capable of reversibly prolapse - ion embedded; the a negative electrode comprising a negative electrode current collector, the negative electrode current collector is not involved in the electrochemical reactions; the electrolyte comprises at least one solvent capable of dissolving the electrolyte and the electrolyte ionized; said at least one electrolyte capable of ionizing the charging and discharging process reduction occurs in the negative electrode - deposition and oxidation - dissolved active ions; the positive electrode current collector material comprises one selected from a carbon-based material, a metal or alloy. The present invention further provides a method for processing a battery current collector, the current collector through the process with good stability within the battery voltage range, thus ensuring stable charge and discharge of the battery. A method for processing a battery collector, the battery current collector comprises chemical or electrochemical passivation passivation. Preferably, the chemically passivating treatment comprises an oxidizing agent through the current collector, the collector surface passivation film is formed, the oxidizing agent is selected from concentrated nitric acid or ceric sulfate. Preferably, said process comprising an electrochemical passivation of the current collector or the charge and discharge current of the battery fluid containing the charge and discharge process, so that the current collector surface passivation film is formed. The present invention further provides a method for processing a battery current collector, the current collector is selected from aluminum, aluminum alloy or stainless steel, a passivation treatment method: for containing the fluid current battery charge and discharge, the charge voltages are charged to 2.35 -2.45V, average discharge voltage to the discharge 1 .35 - 1 .45V, the charge and discharge is not less than 1. The present invention further provides a method for processing a battery current collector, the current collector is selected from aluminum, aluminum alloy or stainless steel, a passivation treatment method: to the current collector is of a three-electrode system or the working electrode two-electrode system comprising the current collector is charged and discharged, the charging voltage are charged to 2.35 -2.45V, average discharge voltage to the discharge 1 .35 - 1 .45V. The present invention further provides a method for processing a battery current collector, the current collector is selected from aluminum or stainless steel, a passivation treatment method: the collector into the oxidizer solution, for 0.5 - 1 hour, the collector surface passivation film is formed, the current collector removed cleaned and dried. The present invention provides safe operation of the battery, the production cost is low, and the current collector through the passivation process of the present invention provides a process excellent in the stability range of the battery, the battery does not participate in the reaction, so that a battery having excellent cycle performance and long life, suitable as a substitute for large-scale energy storage in the field of energy storage systems as well as lead-acid batteries. The present invention also provides a battery including a positive electrode, a negative electrode and an electrolyte, said positive electrode comprising a positive electrode current collector and the positive electrode active material participating in the electrochemical reaction of the positive electrode active material capable of reversibly prolapse - ion embedded; the least negative a negative electrode comprising a current collector; the electrolyte comprises at least one solvent capable of dissolving the electrolyte and the electrolyte ionized; the electrolyte capable of ionizing the at least one reducing charge and discharge occur in the negative electrode - deposition and oxidation - dissolving reactive ion; the negative electrode collector or a porous layer formed on the surface of the graphene layer, said porous layer having micron or submicron or nano-sized pores. Preferably, the porous layer or the graphene layer thickness in the range of 0.05- l mm. Preferably, the micron or submicron range of the pores to the volume of porous layer is 50 to 95%. Preferably, the range to the volume of nanopores of the porous layer is 10 to 99%. 150nm - Preferably, the range of the average diameter of the nano-scale apertures is l.
Material Preferably, the porous layer is selected from a carbon-based material. Preferably, the carbon-based material is selected from Ketjen black, active carbon, carbon nanotubes, carbon fiber, at least one of graphite. Preferably, the carbon-based material is a mixture of activated carbon powder and a binder, the percentage by weight of activated carbon powder of the porous layer range from 20 to 99%. Preferably, the negative electrode further comprises a negative electrode formed on the collector surface active material, the anode active material capable of oxidizing in the battery discharge process - dissolution of the active ion. Preferably, the material of the negative electrode current collector is selected from carbon-based materials, stainless steel, or silicon having a plating / coating metal, the plating / coating contains C, Sn, In, Ag, Pb, Co, Zn elemental , an alloy, or an oxide of at least one. The present invention also provides a battery comprising a cathode, an anode, an electrolyte, said positive electrode comprising a positive electrode active material, the positive active material capable of reversibly prolapse - ion embedded; said negative electrode active material involved in the electrochemical reactions comprising; the electrolyte comprises at least one electrolyte capable of dissolving the electrolyte and the ionization solvent; said at least one electrolyte capable of ionizing the discharge process of the negative reduction takes place - deposition and oxidation - ions or dissolved active / and at least one charge-discharge process in the positive electrode can reversibly prolapse - embedded ions, the negative electrode active material capable of being oxidized during discharge - dissolving said active ion; said negative electrode further comprises a negative electrode formed in the active the porous material layer or the surface of the graphene layer, said porous layer having micron or submicron or nano-sized pores. Ion embedding compound - the present invention also provides a battery including a positive electrode, a negative electrode, a separator and an electrolyte, said positive electrode comprising a positive electrode current collector and the positive electrode active material involved in the electrochemical reaction of the positive electrode active material capable of reversibly prolapse ; the negative electrode is electrochemically conductive case is not involved in the electrochemical reaction; the electrolyte is an aqueous solution containing at least during charging and discharging of the negative electrode reduction occurs - deposition and oxidation - dissolved metal ions; the a negative electrode comprising a negative electrode collector and a porous layer having micron pore surface of the negative electrode current collector. The present invention provides safe operation of the battery, the low production cost, the negative electrode surface is formed with a porous layer or a graphene layer, is deposited on the one hand provide greater active surface area than the ions in the electrolyte, the negative electrode effectively reduce dendrite, on the other hand also reduces the migration distance of the ion activity, the active ions in the solution during charge and discharge diffusion resistance problem, such that electrochemical cell having excellent performance and cycle life of the battery of the present invention is suitable as a large storage areas of the storage system and replace lead-acid battery of the present invention also provides a battery including a positive electrode, a negative electrode and an electrolyte, said positive electrode comprising a positive electrode current collector and the positive electrode active material participating in the electrochemical reaction of the positive electrode active material capable of reversibly prolapse - embed ion ; said negative electrode includes at least a negative electrode current collector; the electrolyte comprises at least one electrolyte capable of dissolving the solvent and the electrolyte ionized; the electrolyte capable of ionizing the at least one reducing charge and discharge occur in the negative electrode - deposition and oxidation - dissolved active ions; ρ of the electrolytic solution Value in the range 3-7. Preferably, the solvent is water or an alcohol solution. Preferably, the active ions include metal ions, the metal is selected from Zn, Fe, Cr, Cu, Mn, Ni, at least one of Sn. Preferably, the pH of the electrolytic solution 4. Preferably, the negative electrode current collector material is selected from metals Ni, Cu, Ag, Pb, Sn, Fe, Al or one of the metal through the passivation treated. Ion embedding compound - the present invention also provides a battery including a positive electrode, a negative electrode, a separator and an electrolyte, said positive electrode comprising a positive electrode current collector and the positive electrode active material involved in the electrochemical reaction of the positive electrode active material capable of reversibly prolapse ; the negative electrode is electrochemically conductive case is not involved in the electrochemical reaction; containing at least the electrolyte during charging and discharging occurs at the negative electrode reduction - oxidation and deposition - of an aqueous solution of dissolved metal ions; the electrolysis the pH range of solution is 3-7. The present invention also provides a battery comprising a cathode, an anode, an electrolyte, said positive electrode comprising a positive electrode active material, the positive active material capable of reversibly prolapse - ion embedded; said negative electrode active material involved in the electrochemical reactions comprising; the electrolyte comprises at least one electrolyte capable of dissolving the electrolyte and the ionization solvent; said at least one electrolyte capable of ionizing the discharge process of the negative reduction takes place - deposition and oxidation - ions or dissolved active / and at least one charge-discharge process in the positive electrode can reversibly prolapse - embedded ions, the negative electrode active material capable of being oxidized during discharge - dissolving said active ion; the pH range of the electrolytic solution is 3 - 7. The present invention provides safe operation of the battery, the production cost is low, in the range of 3-7 pH value of electrolyte to ensure the electrolyte ions having the appropriate concentration of active and reversible prolapse - ion embedding, so as to ensure the capacity of the battery, the present invention the electrochemical cell having excellent performance and cycle life of the battery of the present invention is suitable as a substitute for large energy storage system and the storage areas of the lead-acid battery. The present invention provides a battery with high energy density, stable cycle performance, with significant potential applications in areas such as mobile phones, notebook computers and other portable electronic products, electric vehicles, power tools and so on. A battery comprising a positive electrode 10, negative electrode 20 and an electrolyte (not shown). The positive electrode 10 includes a positive electrode current collector 12 and the electrochemical reaction involved in the positive electrode active material 14, the positive electrode active material capable of reversibly emerge 14 - Embed ion; a negative electrode comprising a negative electrode current collector 20 is at least 22; at least one electrolyte solution comprises an electrolyte and an electrolyte capable of dissolving ionizing solvent; an electrolyte capable of ionizing a reduction occurs in the negative electrode during charging and discharging at least one - deposition and oxidation - ions 28 dissolved active. Please refer to FIG. 1, a schematic view of the structure of the battery of the first embodiment of the present invention, FIG. 1, in the first embodiment, the negative electrode of the battery 20 includes a negative current collector 22 only. The positive electrode active material of the positive electrode 14 participate in the reaction and is capable of reversibly prolapse - Embed ions or functional groups. Specifically, the positive electrode active material capable of reversibly emerge 14 - lithium ions, sodium ions, magnesium ions or zinc ions. The positive electrode active material 14 may be in line with the general formula Li 1 + x Mn y M z O k can be reversibly prolapse - a compound of the spinel structure lithium ions embedded, wherein, -1≤ X≤0.5, 1 <y < 2.5, 0 <z≤0.5, 3 <k≤6, M is selected from Na, Li, Co, Mg, Ti, Cr, V, Zn, Zr, Si, at least one of Al. Preferably, the positive electrode active material 14 containing LiMn 2 0 4. More preferably, the positive electrode active material 14 containing a modified clad is doped or LiMn 2 0 4. The positive electrode active material 14 may be in line with the general formula Li 1 + x M y M ' z M "c 0 2 + n can reversibly prolapse - lithium ions embedded in a layered structure compound, wherein, -l <x≤0.5, 0 <y <1, 0 <z <1, 0 <c ≤1, -0.2 <n <0.2, M, M ', M〃 independently selected from Ni, Mn, Co, Mg, Ti, Cr, V, Zn, zr, Si or Al of at least one. preferably, the positive electrode active material 14 comprising LiCo0 2. The positive electrode active material 14 may be in line with the general formula Li x M y M 'y ( X0 4) n can be reversibly prolapse - olivine structure compounds embedded lithium ions, where, 0 <X ≤2, 0 < y <0.6, 1 <n <1.5, M is selected from Fe, Mn, V or Co, M 'is selected from Mg, Ti, Cr, V, or Al is at least one, at least one X is selected from S, P or Si. Preferably, the positive electrode active material 14 comprising LiFeP0 4. In the lithium battery industry now, almost all of the positive electrode active material 14 will have been modified doping, coating and other processing. However, doping, coating and other means causing chemical modification of the general formula of complex expression, such as LiMn 2 0 4 is no longer able to represent the "lithium manganate" widely used in the formula, and the formula should be Li 1 + x mn y M z O k prevail widely includes various modified through the LiMn 2 0 4. The same, LiFeP0 4 LiCo0 2 and should be broadly construed to include a variety of through doping, coating and other modified, are in line with the general formula Li x M 1 -y M 'y (X0 4) n and Li 1 + x M y M 'z M " c 0 2 + n positive electrode active material. The positive electrode active material 14 of the invention is a reversible prolapse - when the lithium ion intercalation compounds, can use as LiMn 2 0 4, LiFeP0 4, LiCo0 2, LiM x P0 4, LiM x SiO y ( wherein M is one variant monovalent metal) etc. compound. Moreover, prolapse - embedding compound such as sodium ion NaVP0 4 F, prolapse - embedding compound such as zinc ions γ-Μη0 2, prolapse - embedding compound of a metal such as magnesium ion MgM x O y (wherein M is, 0.5 <x <3, 2 <y <6), and having a similar function, can emerge - ion insertion compound or a functional group can be used as a positive electrode active material of the battery 14 of the present invention. In specific embodiments, in the preparation of positive electrode slurry, the positive electrode slurry 14 in addition to positive electrode active material, conductive agent and a binder needed. A conductive agent is selected from a conductive polymer, active carbon, graphene, carbon black, carbon fibers, metal fibers, metal powders, metal flakes and one or more. A binder selected from polyethylene oxide, polypropylene oxide, polyacrylonitrile, polyimide, polyester, polyether, fluorinated polymers, polydivinyl polyethylene glycols, polyethylene glycol diacrylate ester a in polyethylene glycol dimethacrylate, or a mixture, and derivatives of the above polymers. In a particular embodiment, the binder is selected from polytetrafluoroethylene (PTFE) or polyvinylidene fluoride (PVDF). The positive electrode collector 12 and the electron conducting only as a carrier collection, does not participate in the electrochemical reaction, i.e. within the battery voltage range, the positive electrode collector 12 can be stably present in the electrolytic solution and no other side reactions, and thus ensure that the battery having stable cycle performance. Cathode current collector material 12 is selected from a carbon-based material, a metal or alloy. Specifically, the carbon-based material is selected from glassy carbon, graphite, carbon felt, carbon fibers, or an electrically conductive material having a 3D structure of the bicontinuous. Wherein the electrically conductive material having a 3D bicontinuous structure including but not limited carbon foam. Including but not limited to graphite, graphite foil and graphite plate. Metal is selected from Al, Fe, Cu, Pb, Ti, Cr, Mo, Co, Ag, or one of the above passivation treated metal passes. An alloy selected from stainless steel, aluminum alloy, Ni alloy, Ti alloy, Cu alloy, Co alloys, Ti-Pt alloys, Pt-Rh or an alloy of the alloy through the passivation treated. Stainless steels include stainless steel foil or stainless steel, concrete, stainless steel may be, but is not limited to type 300 series stainless steel, such as stainless steel 304, 3 16, 3 16L or 3 16P. Aluminum models can be, but not limited to, the 6000 series aluminum alloys, such as aluminum alloy 6061. Only the negative electrode 20 includes a negative current collector 22 and the anode current collector 22 and the electron conducting only as a carrier collection, does not participate in the electrochemical reaction. 22 anode current collector material is selected from metal Ni, Cu, Ag, Pb, Mn, Sn, Fe, Al, Zn or the said metals passivating process in at least one, or elemental silicon, or carbon-based material, wherein , carbon-based materials include graphite materials, such as commercial graphite foil pressed, wherein the ratio by weight of graphite accounts for 90-100%. Material of the anode current collector 22 may also be selected from stainless steel or stainless steel is passivated. Including but not limited to stainless steel and stainless steel mesh stainless steel foil, the same, may be a type of stainless steel, but not limited to, 300 series stainless steel, such as stainless steel 304, 3 16, 3 16L or 3 16P. Further, the anode current collector 22 may also be selected from a high hydrogen evolution potential of the metal plating / coating, thereby reducing the negative side effects. Plating / coating is selected from the group comprising C, Sn, In, Ag, Pb, Co, Zn simple substance, an alloy, or an oxide of at least one. The thickness of plating / coating is in the range of l - 1000nm. For example: tin-plated copper foil surface of the negative electrode current collector foil or graphite, lead or silver. The positive electrode collector 12 or the negative electrode current collector 22 primary purpose is to make the surface passivation of the current collector of a passivation oxide film is formed, so that the battery charging and discharging process, and can stabilize the conduction electrons collected role, and will not participate in the cell reaction, ensure stable battery performance. Collector passivation treatment method includes a chemical or electrochemical passivation passivation. The passivation treatment by the chemical oxidant comprises a current collector, the current collector so that the surface passivation film is formed. The oxidizing agent the oxidizing agent is chosen principle can collector layer formed on the surface passivation film without dissolving the current collector. Oxidizing agent selected from, but not limited to, concentrated nitric acid or ceric sulfate (Ce (S0 4) 2) . Specifically, the chemical passivation steps: a collector into the oxidizer solution, maintained 0.5 to 1 hour to the current collector surface passivation film is formed, and finally remove the collector cleaned and dried. In an embodiment a stainless steel mesh or stainless steel foil treated with a chemical passivation, the passivation process is particularly: at 50 ° C, the stainless steel into a 20% concentrated nitric acid solution for 0.5 hours so that the surface is formed of stainless steel passivation film, and finally washed with water and dried stainless steel removed in a drying cabinet at 50 ° C in. In another embodiment, the processing of stainless steel mesh or stainless steel foil with a chemical passivation, the passivation process is specifically: stainless steel into 0.75 mol / L of Ce (S0 4) 2 solution, maintained 0.5 hours, so that the stainless steel the surface passivation film is formed, and finally remove the stainless washed with water and dried in a drying cabinet at 50 ° C.
Electrochemical passivation treatment comprises a current collector or battery charge and discharge current of the fluid containing the charge and discharge process, so that the current collector surface passivation film. Direct current charging and discharging fluid, i.e. the collector for pre-passivation process prior to assembling the battery, particularly, to the current collector of the charge-discharge three-electrode system as a working electrode, and then select the appropriate corresponding counter electrode and reference electrode. Are charged to the charging voltage 2.35-2.45V, average discharge voltage to the discharge 1 .35 - 1 .45V. The current collector may be a metal, such as aluminum; collector may be an alloy, such as stainless steel or an aluminum alloy. Of course, two-electrode system may be used as the working electrode current collector to be charged and discharged, the charging voltage are charged to 2.35-2.45V, average discharge voltage to the discharge 1 .35 - 1 .45V. In an embodiment a direct current, in aluminum alloy fluid, to aluminum as a working electrode, a zinc foil as a counter electrode and a reference electrode, an electrolytic solution containing 1 .5 mol / L zinc acetate and 3 mol / L lithium acetate an aqueous solution of the three-electrode system is charged and discharged, the charging voltage charged to 2.4V, 2.4V such that the aluminum alloy surface at the oxide layer of the passivation of an oxide film is formed, the cutoff voltage of 1 .4V discharge. May also contain a battery charge and discharge current collector so as to achieve the purpose of passivating the current collector, the charge voltage are charged to 2.35-2.45V, average discharge voltage to the discharge 1 .35- 1 .45V, charge and discharge not less than 1. The current collector may be a metal, such as aluminum; collector may be an alloy, such as stainless steel or an aluminum alloy. In an embodiment of performing a passivation process after assembled into one pair of battery current collector, a positive electrode active material 14 is LiMn 2 0 4, an aluminum alloy cathode current collector 12, negative electrode current collector 22 is a copper foil, an electrolytic solution comprising .5 mol / L zinc acetate aqueous solution and 3 mol L / lithium acetate, are charged to the charging voltage 2.4V, charging cut-off voltage of 2.4V, i.e., such that the aluminum oxide formed at the surface of the passivation layer 2.4V film; 1 .4V off voltage of discharge, the battery charge and discharge times is not less than 1 times. The more the number of charging and discharging of the battery, the better the aluminum passivation effect, more stable in the electrolyte. In the process of electrochemical passivation of aluminum alloys, after the charging voltage reaches 2.4V and held for a period of time, the aluminum corrosion current increases as the time maintained significantly reduced. Specifically, the charging voltage reaches 2.4V gradually extended maintenance time 10 minutes to 1 hour, aluminum corrosion current decreased significantly, and gradually extended duration from 1 to 24 hours, the corrosion current is not decreased obviously, and therefore, more after reaching 2.4V it is preferred, and the charging voltage is maintained for at least 1 hour. Electrolyte is neutral or weakly acidic aqueous solutions, such as perchlorate, sulfate, nitrate, acetate, formate or a phosphate, the cathode collector 12 and anode current collector 22 can be maintained stable in the electrolytic solution, i.e., no side reaction occurs in battery voltage window, thus ensuring the stability of the battery performance. The passivation treatment of the present invention provides a current collector, the cathode current collector 12 and anode current collector 22 applies pair. To make the active ions in the electrolyte of the negative electrode 28 is more uniformly deposited on the surface 20, the negative electrode 20 formed on the surface of the porous layer 30, porous layer 30 in any suitable manner such as coating, pressing, etc. formed on the surface of the negative electrode 20. The porous layer 30 thickness in the range of 0.05- l mm, the porous layer 30 having micron or submicron or nanoscale pores, micron or submicron pore volume in the range accounting for the porous layer 30 is 50 to 95%. Nanoporous account the range 10-99% by volume of the porous layer 30, the average diameter of nanoporous 1 -999nm preferred range of the average diameter of the pores of nano-l - 150nm. The porous layer 30 is not involved in the negative electrode 20 of the electrochemical reaction, the porous layer 30 having large surface area, charging can occur during deposition - 28 reducing reactive ion deposition provide a greater surface area so that the active ions in the negative electrode current collector 28 fluid 22 are deposited on the surface to more effectively reduce the negative dendrites. Further, the porous layer 30 is formed on the surface of the negative electrode current collector 22, 28 may also be shortened active ions migrate from the charge-discharge process, reactive ion requires 28 a shorter distance diffusion can complete charge-discharge process, the reactive ion solution 28 problems diffusion resistance is present during the reaction. Meanwhile, since the negative electrode 20 provided with the porous layer 30, a thinner separator can be used in the preparation of the battery, the battery charging process, especially oxygen generated during overcharge of the positive electrode can be more easily migrate to the negative electrode 20 is reduced to enhance cell reversibility. The porous material of layer 30 is selected from a carbon-based material, carbon-based material selected from carbon black, activated carbon, carbon nanotubes, carbon fiber, at least one of graphite. Including but not limited to carbon black, Ketjenblack (KB), acetylene black. KB has a large specific surface area and a strong adsorption capability, the active ions in the negative electrode 20 is deposited on the ground more uniform, strong and KB conductivity can be improved electrochemical performance when the large current charging and discharging the entire battery. Carbon-based material may be a mixture of activated carbon and binder, the porous layer of activated carbon accounted for 30 weight range from 20 to 99%. The specific surface area of activated carbon range 200-3000m 2 / g. Specifically, the commercial activated carbon powder (particle size range l -200mm) and polyvinylidene fluoride were uniformly mixed ethylene (PVDF), was added N- methyl-pyrrolidone (NMP) was dissolved into a paste, applied to the anode current collector 22 surface. 30 is a porous layer thickness in the range 0. 1 -0.2mm, by weight of the porous layer NMP accounts for 50-70% of the mixture. Morphology include but are not limited to activated carbon activated carbon powders, activated carbon granules, activated carbon, activated carbon fiber cloth or felt, the range of the specific surface area activated carbon or activated carbon fiber felt cloth is 100-2200m 2 / g. Specifically, the activated carbon particles are mixed with conductive graphite, and then uniformly mixed with NMP of PVDF,, the negative electrode current collector coated surface of the fluid 22. Thickness of the porous layer 30 is between 0. 1 -0.2mm. Conductive graphite effect is to increase the electron conductivity of the negative electrode layer 30 is porous. Wherein the porous layer of activated carbon accounted for 30% of the weight range 20 to 80, the electrically conductive porous graphite layer 30 accounting for 5 to 20% by weight, the adhesive layer of the porous PVDF weight range accounts for 30% of 5-15. Activated carbon material having a porous structure and a large specific surface area, the carbon-based material, the price is relatively cheap carbon nanotubes class. Further, the specific production process of a negative electrode comprising a porous layer is relatively simple, easy industrialization. Preferably, the negative electrode 20 formed on the surface of the graphene layer. Graphene has outstanding thermal conductivity and mechanical properties, theoretical specific surface area of up to 2600m 2 / g, and at room temperature for high speed electron mobility, thereby forming the negative electrode 20 the surface of the graphene layer can not only provide for the deposition of the active ions 28 large surface area, while the ability to further improve electrical conductor 20 to the negative electrode, thereby improving the electrochemical performance of the battery current is large. In the first embodiment, only the negative electrode 20 includes a negative current collector 22, and therefore, the porous layer or the graphene layer is formed on the surface of the negative electrode current collector fluid 22. Comprising at least one electrolyte capable of dissolving the electrolyte and the electrolyte ionized solvents, the solvent comprises at least one, including but not limited to the alcohol solution as ethanol or methanol, or aqueous alcoholic solution. An electrolyte capable of ionizing the at least one charge and discharge negative electrode 20 in the process of reductive - active ion dissolved 28 - deposition and oxidation. Reactive ion concentration in the range of 28 to 0.5 - 15mol / L. In specific embodiments, the 28 active ions include metal ions, the metal is selected from Zn, Fe, Cr, Cu, Mn, Ni, at least one of Sn. Metal ions present in the electrolyte in chlorate, sulfate, nitrate, acetate, formate, phosphate and the like. Preferably, the metal ions present in the electrolyte in the form of sulfate, acetate or mixtures of sulfate and acetate. Preferably, the electrolyte further comprises an electrolyte, an electrolyte capable of ionizing the at least one charge-discharge process in the positive electrode can reversibly emerge 10 - 16 embedded ions, thereby improving the positive electrode active material 14 and the ion exchange rate in the electrolyte, improve the battery in the high rate charge-discharge performance. Specifically, the positive electrode active material capable of reversibly emerge 14 - embedding compound lithium ions, the electrolyte can also be the corresponding ionized lithium ions. Reversible prolapse - 16 embedded ions include lithium ions or sodium ions or magnesium ions or zinc ions, the reversible prolapse - ion 16 embedded in the electrolytic solution concentration range of 0. 1 -30mol / L. In order to ensure the battery capacity, the concentration of the active ions in the electrolyte 28 must reach a certain range, when too alkaline electrolyte, the electrolyte will affect the solubility of the active ions 28; peracid when the electrolyte, corrosion of the electrode material occurs and protons during charge and discharge were embedded problems, and therefore, pH value in the scope of the present invention, the electrolytic solution is 3-7. When charging, prolapse reversible prolapse of the 14 positive electrode active material - embedded ions 16, while the positive-electrode active material 14 becomes a divalent metal is oxidized and releasing electrons; Electronic via: Please, the charge and discharge principles battery 2 with reference to FIG. the external circuit 20 to the battery negative electrode, while the activity of ions in the electrolyte in the negative electrode 20 to give 28 electrons is reduced and deposited on the surface of the anode current collector 22, forming an active layer 26 ion deposition. Discharge process was reverse charging process, as shown in FIG. In the first embodiment, the first operation of the cell is reversible prolapse prolapse positive electrode active material in 14 - 16 embedded ions, the negative electrode active ion 28 20 reductive - active ion deposition process the charging layer 26 is deposited. Battery capacity depends on the capacity of the positive electrode active material 14, and therefore, when charging the first battery, the positive electrode active material 14 must contain enough reversible prolapse - 16 ion embedded. Before the user does not perform the charging process can not be used as a power supply, thus ensuring the capacity of the battery does not suffer any form prior to use. Referring to FIG. 4, a second embodiment of the present invention provides a battery, the difference between the disclosed embodiment and the first embodiment is a battery: a second embodiment 20 embodiment further includes a negative electrode formed on the surface of the anode current collector 22 negative electrode active material 24, negative electrode active material 24 can be oxidized during discharge - 28 dissolving the active ion. Only as a negative electrode current collector 22 and the electron conductive carrier collection, the negative electrode 20 does not participate in the reaction, the anode active material 24 formed on the anode current collector by coating, plating or sputtering 22, including but not limited to a sputtering method Magnetron sputtering. Specifically, a copper foil negative electrode current collector 22, negative electrode active material 24, zinc is formed on the copper foil surface by electroplating. Preferably, the negative electrode active material 24 formed on the pretreated surface after the anode current collector 22 on the fluid, the method comprising surface preparation of at least one mechanical, chemical or electrochemical treatment. Specifically, when the negative electrode current collector 22 is Cu, Cu of pretreatment method may be manual / mechanical polishing, removing part of the surface thereof while it is dark surface has a certain roughness, but can not completely remove manually polished Cu impurities on the surface, such as CuO, Cu therefore require further chemical treatment, chemical treatment may be a mixture of different acid formulated be soaked, such as sulfuric acid, nitric acid and hydrochloric acid. Methods of pretreatment depends on the particular selection of the anode current collector 22, typically a mechanical, chemical, electrochemical three methods in combination. The present embodiment, the negative electrode 20 includes a negative current collector 22 and the negative electrode active material 24, and therefore, the porous layer or the graphene layer is formed on the surface of the anode current collector 22. Negative electrode active material formed on the porous layer or the surface of the graphene layer by coating, sputtering, plating or the like. Likewise, the positive electrode 10 includes a positive current collector 12 and the positive electrode active material 14. The positive electrode collector 12 is not involved in the electrochemical reaction of the positive electrode active material capable of reversibly emerge 14 - embedding ions such as lithium ions, sodium ions, magnesium ions or zinc ions, but in the second embodiment, the battery is not defined in the preparation of the positive electrode active if the substance 14 itself contains a lithium ion, sodium ion, magnesium ion or zinc ions, particularly, positive electrode active material 14 can have four states: a reversible prolapse does not contain - embedded ions 16, and can further contain embedded reversible prolapse - embedded ions 16, comprising a reversible prolapse - 16 ions and reversibly embedded prolapse - 16 ion saturation embedded, comprising the reversible prolapse - ion embedded reversible prolapse and 16 - 16 embedded ions reached saturation. Comprising at least one electrolyte capable of dissolving the electrolyte and the electrolyte ionized solvents, solvents include aqueous or alcoholic solution, alcohol solution including but not limited to methanol and ethanol. In this case, the electrolyte capable of ionizing the at least one charge and discharge negative electrode 20 in the process of reductive - deposition and oxidation - 28 or dissolved active ions during charging and discharging at least one of the positive electrode 10 can be reversibly prolapse - ion embedded 16 or containing both active ion and a reversible prolapse 28 - 16 embedded ions. The second embodiment disclosed in the battery, the positive electrode active material during charge and discharge 14 can be reversibly prolapse - ion embedding, but the active material for the positive electrode 14 itself, may not contain reversible prolapse - ion embedded 16, may comprise a reversible prolapse - and the inner structure 16 embedded in the ion receiving can have reversible prolapse - ion embedding hole 16 may also be self-contained reversible prolapse - ion intercalation and 16 reach saturation even supersaturated state, therefore, the battery the positive electrode active material 14 has a great choice in the selection, and further, the electrolyte 28 may comprise active ions and / or reversible prolapse - embedded ions 16, so that the battery in the present invention may be selected depending on the application different battery operation, battery adaptability. Different states of the operation mode set forth below to further positive electrode active material and an electrolyte 14 constituting the battery. A battery comprising a positive electrode 10, negative electrode 20, electrolyte solution (not shown). The positive electrode 10 includes a positive electrode current collector 12 and the positive electrode active material 14, the positive electrode active material capable of reversibly emerge 14 - Embedding ions. The negative electrode 20 includes a negative current collector 22 and the electrochemical reaction involved in the negative electrode active material 24. Comprising at least one electrolyte capable of dissolving the electrolyte solvent and the electrolyte ionized. At least one electrolyte capable of ionizing a positive electrode capable of reversibly emerge 10 - 16 embedded ion; positive electrode active material 14 containing no irreversible prolapse - ion embedded 16; first operation of the battery electrolyte is reversible prolapse - ion embedded insert 16 14 to the positive electrode active material, the negative electrode active material oxide 24 - dissolving an active plasma discharge process 28. Specifically, the positive electrode active material is 14 Mn 2 0 4, the negative electrode active material 24 is a metal Zn, electrolyte comprising LiAc. Since the positive electrode active material 14 does not contain lithium, and an electrolyte comprising lithium ions, and therefore, working for the first time the battery electrolyte lithium ions into the positive electrode active material 14, negative electrode active material 24 Zn metal oxide - dissolution of the Zn 2+ discharge process. Preferably, the electrolyte further comprises an electrolyte capable of ionizing the active ions 28, 28 of the negative electrode active ion is capable of reducing the occurrence of 20 - deposition and oxidation - dissolved, so that, when the battery is discharging, the negative electrode 20 may accelerate the exchange of ions in the electrolyte speed. 14 as long as the positive electrode active material during charge and discharge of the compliance can be reversibly prolapse - ion embedding the condition to work, instead of defining a positive electrode active material reversibly prolapse must contain 14 - 16 ion embedded. Although the positive electrode active material capable of reversibly extrusion 14 does not contain - 16 ion embedding, the discharge procedure when the battery needs to work first time, but when the user purchased the battery of the present invention, can also be directly used as a power supply, while battery life is long. A battery comprising a positive electrode 10, negative electrode 20, electrolyte solution. The positive electrode 10 includes a positive electrode current collector 12 and the positive electrode active material 14, negative electrode 20 includes a negative current collector 22 and the electrochemical reaction involved in the negative electrode active material 24, an electrolyte comprising at least one solvent capable of dissolving the electrolyte and the electrolyte ionized electrolyte ionizable at least one negative electrode 20 in the reduction occurs - at least one positive electrode 28 and 10 can be reversibly dissolved active ions prolapse - - 16 embedded ion deposition and oxidation; - ion embedded positive electrode active material 14 capable of coming out and fitted reversibly prolapse 16; first operation of the cell is reversible prolapse - embedded ions 16 coming out from the positive electrode active material 14, active ions 28 in the negative electrode 20 is reduced and the deposition of the charging process or reversible prolapse - embedded ion 16 embedded in the positive electrode active material 14, negative electrode active material 24 is oxidized and dissolved active ion discharge process 28. Specifically, the positive electrode active material 14 containing Li ^ x Mn 2 0 4, the negative electrode active material 24 is a metal Zn, electrolyte comprising zinc acetate and lithium acetate. The positive electrode active material 14 coming out both Li +, at the same time, the positive electrode active material a spinel structure as well as a hole 14 for Li + in the electrolyte is embedded, therefore, the battery may discharge the first operating mode: the electrolytic solution of Li + embedded Li ^ x Mn 2 0 4, the negative electrode active material 24 is dissolved Zn metal oxide and Zn 2+; first battery charging operation mode may be: i.e. the extrusion 204 Li ^ x Mn Li +, electrolyte solution Zn 2+ in the negative electrode 20 forming the active ion reduced and deposited layer 26 is deposited. Thus, the working cell may be a first charging process, the process may be discharged. When users buy a battery of the present invention, no consideration is to charge the battery before using or discharging the battery, can be used, according to the present invention, and the battery life is very long. Preferably, the battery is a reversible first working prolapse - 16 embedded ions released from the positive electrode active material 14, negative electrode active ion 28 20 reductive - deposition charging process. A battery comprising a positive electrode 10, negative electrode 20, electrolyte solution, the positive electrode 10 includes a positive current collector 12 and the positive electrode active material 14, negative electrode 20 includes a negative current collector 22 and the electrochemical reaction involved in the negative electrode active material 24; the electrolytic solution comprises at least one species capable of dissolving the electrolyte solvent and the electrolyte ionized; an electrolyte capable of ionizing the at least one positive electrode capable of reversibly emerge 10 - 16 embedded ion; positive electrode active material and the insert 14 can be a reversible prolapse prolapse - ion embedded 16; first cell work is reversible prolapse - ion embedded embedding positive electrode active material 16 14, the negative electrode active material oxide 24 - dissolving an active plasma discharge process 28. Specifically, the positive electrode active material 14 containing Li ^ x Mn 2 0 4, the negative electrode active material 24 is a metal Zn, electrolyte comprises lithium acetate. The positive electrode active material 14 coming out both Li +, Li + can be fitted, the electrolytic solution containing Li +, therefore, the first job is Li + battery embedded Li ^ x Mn 2 0 4, Zn metal oxide - dissolution of Zn 2+ the discharge process. Although the battery is required to work the first discharge process, but the user at the time of purchase of the battery of the present invention, can also be directly used as a power supply, without affecting the performance of the battery, and the battery after the initial charge and discharge normally work, while battery very long life. A battery comprising a positive electrode 10, negative electrode 20, electrolyte solution, the positive electrode 10 includes a positive current collector 12 and the positive electrode active material 14, the positive electrode active material capable of reversibly emerge 14 - embedded ions; negative electrode 20 includes a negative current collector 22 and the electrochemical reaction involved in 24 of the negative electrode active material; capable of dissolving at least one electrolyte solution comprises an electrolyte solvent and an electrolyte ionized; an electrolyte capable of ionizing the at least one reduction occurs in the negative electrode 20 - deposition and oxidation - 28 dissolved active ions; first operation of the cell is reversible prolapse - embedded ions are extracted from the positive electrode active material 14, 28 in the negative electrode active ion reduction 20 - deposition charging process. Specifically, the positive electrode active material 14 containing Li ^ x Mn 2 0 4, the negative electrode active material 24 is a metal Zn, electrolyte contains zinc acetate, both the positive electrode active material 14 prolapse Li +, can be embedded Li +, and therefore, the battery the first job is in Li + 2 0 4 coming out from Li ^ x Mn, Zn 2 + in the electrolyte in the negative electrode 20 occurs reduction - deposition charging process. A battery comprising a positive electrode 10, negative electrode 20, electrolyte solution, the positive electrode 10 includes a positive current collector 12 and the positive electrode active material 14, the positive electrode active material capable of reversibly emerge 14 - embedded ions; negative electrode 20 includes a negative current collector 22 and the electrochemical reaction involved in the negative electrode active material 24; the electrolytic solution comprises at least one electrolyte capable of dissolving the solvent and the electrolyte ionized; at least one electrolyte capable of ionizing a reduction occurs in the negative electrode 20 - 28 reactive ion deposition; reversible cathode active material 14 coming out - embed ion 16 reaches saturation; first operation of the cell is reversible prolapse - 16 embedded ion released from the positive electrode 10, negative electrode active ion 28 20 reduction - deposition charging process. Is well known to the skilled person, the positive electrode active material reversibly extrusion 14 - 16 ions embedded in a saturation state, to reverse prolapse - ion embedded hole 16 has substantially occupy a position in the structure of the cathode active material 14, and the positive electrode active material 14 structural stability, stable operation of the battery charging and discharging process. Charging the battery for an initial working process, to reverse prolapse - 16 embedded ions released from the positive electrode active material 14, active ions in the electrolyte 28 in the anode 20 reducing the occurrence - Deposition. Although the user needs to be charged to operations in the purchase of such batteries, but because of this, the battery capacity before first use will not suffer any form, so as to ensure the performance of the battery in the late use. Preferably, the electrolyte further comprising an ionizable positive electrode capable of reversibly prolapse 10 - embedded ionic electrolyte 16, so that the battery discharges, the exchange rate can accelerate ions in the positive electrode 10 and the electrolyte, to improve high rate charge-discharge performance of the battery. Thus, as long as the electrolytic solution contained in the negative electrode 20 can be reductively - deposition and oxidation - dissolved active ion battery 28 to allow, say, the electrolytic solution in this battery, only need to add active ions 28, rather than needs to contain mandatory capable of reversibly prolapse - 16 ions embedded, the battery can work properly. Simple battery electrolyte components, low production cost, a battery having a wider range of applications. A battery comprising a positive electrode 10, negative electrode 20, electrolyte solution, the positive electrode 10 includes a positive current collector 12 and the positive electrode active material 14, the positive electrode active material capable of reversibly emerge 14 - embedded ions; negative electrode 20 includes a negative current collector 22 electrically and participation negative electrode active material 24, a chemical reaction; an electrolyte comprising at least one electrolyte capable of dissolving the solvent and the electrolyte ionized; at least one electrolyte capable of ionizing a reduction occurs in the negative electrode 20 - 28 reactive ion deposition; reversible cathode active material 14 coming out - embedded ions 16 is too saturated; the first operation of the cell is reversible prolapse - 16 embedded ions released from the positive electrode 10, negative electrode active ion 28 20 reduction - deposited as an anode active material 24 of the charging process. Those skilled in the art is well known, the positive electrode active material 14 reversible prolapse - embedded ions 16 is supersaturated, i.e. the positive electrode active material Preparation 14, the positive electrode active material 14 in the basic saturation on the further positive electrode active material 14 embedded plasma treatment, in order to increase the capacity of the positive electrode active material 14 of positive electrode active material in order to ensure the stability of the structure 14, the surface of the positive electrode active material 14 is coated or modified by a metal or a metal oxide. Specifically, metals including but not limited to Al, metal oxides including but not limited to A1 2 0 3. Specifically, the positive electrode active material 14 is coated with A1 2 0 3 Li 1 + x Mn 2 O 4 (0 <X <0.5), the negative electrode active material 24 is a metal Zn, electrolyte comprising zinc acetate. 14 in the content of Li + of the positive electrode active material has reached saturation, and therefore, the battery is first work Li + + x Mn 2 0 4 coming out from the Li 1, Zn 2+ in the electrolyte of the negative electrode 20 reduction occurs - deposited as reactive ion deposition layer 26 of the charging process. Preferably, the electrolyte further comprising an ionizable positive electrode capable of reversibly emerge 10 - battery charge and discharge performance embedded ionic electrolyte 16, so that, when the battery is charging, the positive electrode 10 and the electrolyte can accelerate the ion exchange rate, improve . The second embodiment of the negative electrode cell 20 includes a negative current collector 22 and the electrochemical reaction involved in the negative electrode active material 24, the first operation mode of the battery have more choices, whereby the user depending on the application producer case, the positive selection cells 10, 20 and the negative electrode with the electrolytic solution, to produce batteries having different charge and discharge modes. The third embodiment of the present invention also discloses a battery, the second embodiment differs from the embodiment disclosed in the battery: the negative electrode 20 in the third embodiment comprising only the anode current collector 22, negative electrode current collector 22 but only as electron conducting and collecting the carrier, also corresponding to the negative electrode active material capable of participating in the anode reactor 20, during cell discharge can be oxidized - dissolving the active ion 28, i.e., the negative electrode collector same as active-ion material 28 of material 22, for example: reactive ion 28 zinc ions, corresponding to the anode current collector 22 is metallic zinc. In a third embodiment, the negative electrode 20 including a negative electrode current collector of the electrochemical reaction involved in the fluid 22, therefore, a porous layer or a graphene layer is formed on the surface of the anode current collector 22. DETAILED to the third embodiment, the battery 10 is a positive electrode active material 14 is LiMn 2 0 4, the positive electrode collector 12 of stainless steel mesh, the negative electrode current collector 22 is metallic zinc, electrolytic solution is an aqueous solution containing zinc salt. Preferably, the electrolyte is an aqueous solution containing a zinc salt and a lithium salt. Zinc negative electrode 20 may participate in the reaction. When the present invention is used in a battery For the separator, the separator may be an organic or inorganic porous material, the porosity of the separator is 20 to 95% range, the pore diameter range of 0.001 - 100μηι. The present invention provides a battery having a high energy density (up to 60% -80% lithium-ion battery), power density (expected to reach 200% lithium ion battery, or even higher), easy to manufacture, completely non-toxic, environmental protection, recycling is easy and inexpensive (the same battery capacity, it is expected to reach 60% of the lead-acid battery, a lithium ion battery to 20% or even lower), etc., and has good cycle characteristics, in the specific embodiment , 4000 Zhou Hourong battery circulatory remained above 90%. Thus, the present invention is a battery as a new generation of green energy, is very suitable as a substitute for large energy storage system and the storage areas of the lead-acid battery. In the present invention, the weight per unit volume percent of the skilled person in the art, for example, the volume percentage refers to the weight of the solution in 100 ml of solute. Unless otherwise defined, all professional and scientific terms and those skilled in the text used in the familiar sense. Further, any methods and materials similar or equivalent to those described herein Jieke applied to the method of the present invention. The method of the preferred embodiment described herein and the material for exemplary purposes only. In conjunction with the following embodiments, and more specifically the present invention. It should be understood that the embodiment of the present invention is not limited to the following Examples, any form of the present invention made modifications and / or changes will fall within the scope of the present invention. In the present invention, especially if not, all parts, percentages are by weight of the unit, all the equipment and raw materials are commercially available or can be commonly used in the industry. An battle by the circulation method (CV), a three-electrode system constructed to test the stability of different collector in the electrolyte. The working electrode is stainless steel, type 304 stainless steel, a zinc electrode as the counter electrode and a reference electrode, in 2mol L ZnS0 4 and 2mol 2 S0 4 by circulating Method to war An electrical sulfate electrolyte Stainless Steel / / L Li chemical behavior, the voltage range of 1 .0-2.4V. Stainless steel without passivation. FIG 5 is an embodiment - the non-passivated stainless steel 1 cycle of curve 304 battle Ann. As can be seen from the figure for the first time when the stainless steel anode scan appeared in 1 .9V (Vs.Zn) oxide at a broad peak, then there is a clear precipitation peak of 02, with the current increases. The cathode in the subsequent scan, there has been a relatively small reduction peak at 1 .4V. The oxidation peak at 1 cycle after 1 .9V hindered, means forming a surface oxide layer on the stainless steel in the first cycle, the oxide layer inhibits further oxidation of the surface of the stainless steel inner layer. However, oxide layer 02 may be able to initiate the precipitation. Thus resulting in the precipitation peak oxygen potential migration to low and getting bigger. Passivated stainless steel to the working electrode, model 316 stainless steel, a zinc electrode as the counter electrode and a reference electrode, in a sulfate electrolyte solution 2mol / L ZnS0 4 and 2mol / L Li 2 S0 4 in a safe method to battle by circulating electrochemical behavior of passivated stainless steel, the voltage range of 1 .0-2.4V. The method of passivating stainless steel is chemically passivating, specific process: at 50 ° C, 316 stainless steel placed in a 20% concentrated nitric acid solution, maintaining 0.5h, so that the surface passivation film is formed of stainless steel, stainless steel was washed with water and finally removed and dried. FIG 6 is an embodiment of a stainless steel passivated after circulation in the battle Ann curve 1-2. The results showed that after a solution containing an oxidizing agent such as concentrated HN0 3 solution passivated, stainless steel becomes more stable, and the peak 02 is deposited with good reproducibility, no significant differences in the different cycles of precipitation peak shape 02 . On the other hand, 02 is slightly evolution potential to a high electric potential migration, and no significant oxygen precipitation before 2.0V. This result is very important for aqueous battery as passivated stainless steel in an aqueous battery operating voltage range is very stable. Passivated stainless steel to the working electrode, a stainless steel model 3 16P, a zinc electrode as the counter electrode and a reference electrode, an electrolyte nitrate 3mol / L Zn (N0 3) 2 and 6mol / L LiN0 3 circulating through the security battle method to study the electrochemical behavior of passivated stainless steel, the voltage range of 1 .0-2.4V. The method of passivating of stainless steel same as in Example 1-2. FIG 7 is a passivated stainless steel 3 16P CV curve nitrate electrolyte. Aluminum alloy as the working electrode, a zinc electrode as the counter electrode and a reference electrode, at 1 .5mol / L Zn (Ac) 2 and 3mol / L LiAc acetate in the electrolytic solution by the circulation of Aluminum Alloy battle An electrical Method chemical behavior, the voltage range of 1 .0-2.4V, in aluminum alloy surface occurs at 2.4V. 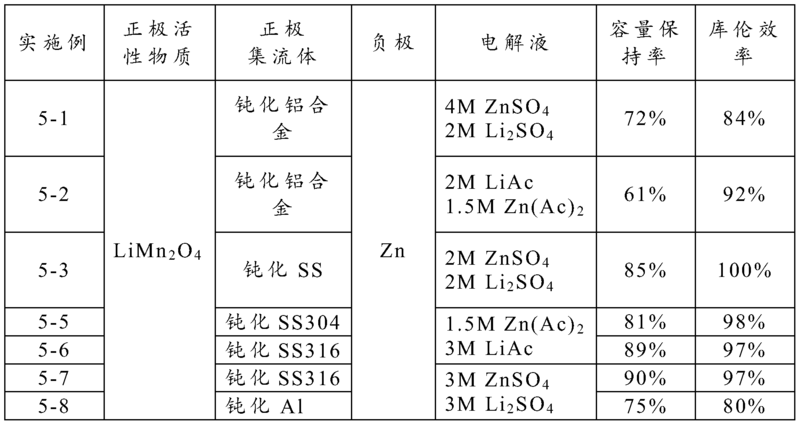 Aluminum alloy as the working electrode, a zinc electrode as the counter electrode and a reference electrode, in 2mol / ZnS0 4 and to study the electrochemical behavior of aluminum 2mol by circulating the electrolyte salt battle Safety Law u L / L Li 2 S0 4 in a voltage range of 1 .0-2.4V, in aluminum alloy surface occurs at 2.4V. Figures 8 and 9, respectively 1-4 and 1-5 in the CV curves aluminum acetate and sulfate electrolytic solution in Examples. In FIG. 8, when the first scan anode significant oxidation peak current slight fluctuations, this phenomenon may be attributed to non-faradaic processes or oxidation or other surface adsorption of ions generated in an aluminum alloy. Aluminum surface is oxidized electrochemically at 2.4V, a passivation film, the first scan after the anode, in 1 .0-2. IV was no peak, and 02 evolution potential to a high electric potential migration of oxygen evolution current smaller. Show that after the electrochemical passivation of aluminum alloy in an aqueous battery operating voltage range is very stable. In non-passivated stainless steel to the working electrode, a zinc electrode as the counter electrode and a reference electrode, studied by cyclic battle An electrolytic method hydrochloride 4mol / L ZnCl 2 and 3mol / L LiCl in unpassivated the electrochemical behavior of stainless steel processing. Figures 10 and 11, respectively CV curves 1-6 and Example 1-7. As can be seen by curve CV graphite foil is relatively stable in hypochlorite solution, in addition to the oxygen precipitation occurs at a high potential outside, no significant oxidation or reduction peaks at the entire electrochemical window, this phenomenon proves carbon based material suitable as a collector in the chlorate solution, while the non-passivated stainless steel less suitable hypochlorite solution. By Tafel curve constructed three-electrode system was tested in a different etching rate collector acetate electrolytic solution. Aluminum foil as the working electrode, zinc as a counter electrode and a reference electrode, an electrolytic solution in acetate 1 .5mol / L Zn (Ac) 2 and 3mol / L LiAc, the aluminum foil to study the corrosion behavior by the Tafel curve. Graphite rod as the working electrode, electrode composition and the remaining three test conditions as in Example 2-1. Aluminum alloy as the working electrode, electrode composition and the remaining three test conditions as in Example 2-1. To passivate the stainless steel 304 as a working electrode, electrode composition and the remaining three test conditions as in Example 2-1. Stainless steel is passivated by specific chemical treatment. To passivate the aluminum alloy as the working electrode, electrode composition and the remaining three test conditions as in Example 2-1. Aluminum is passivated by an electrochemical process, the aluminum alloy charge and discharge, and 1 cycle of charge and discharge. To passivate the aluminum alloy as the working electrode, electrode composition and the remaining three test conditions as in Example 2-1. Particularly aluminum is passivated by an electrochemical process, the charge and discharge of the aluminum alloy, the passivation electrochemical charge and discharge cycle 50 times. As can be seen from Table 1: the maximum corrosion rate of aluminum Weng, stainless steel and aluminum corrosion rate in the acetate solution is 10 times smaller compared to the aluminum foil. After each corrosion rate of stainless steel and aluminum passivating chemical and electrochemical passivation treatment decreased 6-12 times. 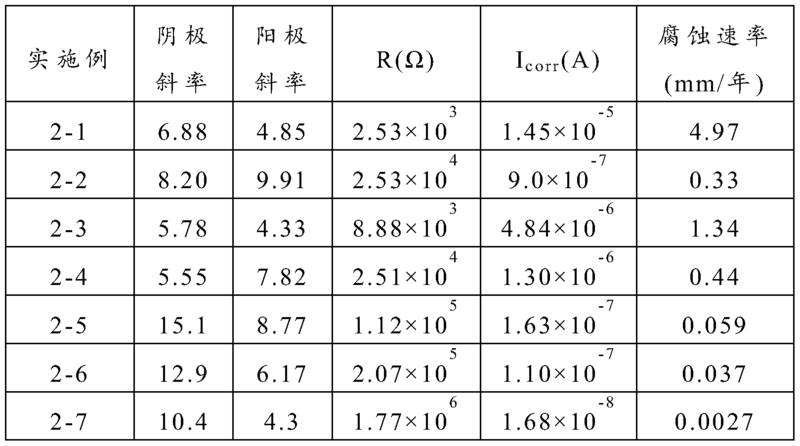 Further, the corrosion rate is further decreased even further alloy electrochemical oxidation, electrochemical oxidation treatment after 50 cycle corrosion rate decreased 150 fold. This result is consistent with the results of CV, CV results show that the oxygen evolution curve cycle several times weaker. Further, by the specific embodiments Electrochemical battery performance. In LiMn 2 0 4 as a positive electrode active material, the positive electrode active material, the conductive agent, acetylene black (AB), a binder polyvinylidene fluoride (PVDF) in accordance with 83: 7 weight ratio and mixing was dissolved in N- methyl: 10 pyrrolidone (NMP) prepared positive electrode slurry. Graphite foil as positive electrode current collector, the positive electrode slurry was coated on the positive electrode current collector, a positive electrode dried for 24 hours in air at 1 10 ° C. Battery anode current collector is stainless steel rod. An electrolyte containing a concentration of 4mol / L zinc chloride, and 3 mo l / L aqueous solution of lithium chloride, by adding to the electrolytic solution titrated 0. 1 mol / L lithium hydroxide to adjust the pH of the electrolyte is 4. Glass mat separator is a fabric. The positive and negative electrodes into a battery assembly, an intermediate separator spaced to inject an electrolyte. Good After standing 12 hours to be then assembled battery begins to charge and discharge rate 4C. Coulombic efficiency versus voltage and discharge capacity of the battery charge and discharge voltage range of the embodiment 3-1 of the present invention is provided FIG. 12, the battery is about 97%, also it shows excellent electrochemical performance of the cell cycle and almost no side reactions occur. The discharge capacity versus cycle number in FIG. 13 of the present invention to provide a battery of Example 3-1 embodiment, it can be seen from the figure, the initial capacity of the battery 0.35mAh, based on the specific capacity of the positive electrode material is 1 HmAhg "1, and capacity battery cycle efficiency after 1000 weeks is still 90%, indicating that the battery cycling performance is very good. Examples 3-6 In the battery positive electrode active material LiLO8Coo.03Alo.03M .94O4, the same as in Example 3-1, and the remaining cells constituting the method of assembling the embodiment. Discharge capacity of the battery 14 is provided in the Example 3-2 versus cycle number, it can be seen from the figure, the cycle efficiency of the battery capacity after 4,000 weeks still 95%, indicating that the use of doping treated LiMn 2 0 4 cycle life of the positive electrode active material obtained is further improved. In LiL05M .89Coo.03Alo.03O4 positive electrode active material, positive electrode active material, a binder P VDF, super-p in accordance with carbon black 83: 7 weight ratio and mixing was dissolved in N- methylpyrrolidone (NMP): 10 the positive electrode slurry was prepared, a graphite cathode current collector plate thickness of lmm. Charge and discharge voltage range of 1.5-2. IV. The rest configuration and battery testing method in Example 3-1. FIG 15 is a discharge capacity of a battery provided in Example 3-3 versus cycle number and the embodiments can be clearly seen from the figure, almost equal to 4000 times the battery discharge capacity and initial discharge capacity, cycle performance of the battery is not only stable, and long cycle life. FIG 16 is a graph of the coulombic efficiency of a battery of Example 3-3 provided with the number of cycles embodiment, it can be seen from the figure after 4000 cycles of the battery, coulombic efficiency is still close to 100%, indicating that the charge and discharge characteristics of the battery according to the present invention very stable. In LiMn 2 0 4 as a positive electrode active material, positive electrode active material, a binder of polytetrafluoroethylene (PTFE), super-p in accordance with carbon black 83: 7 and the mixing ratio was dissolved in N- methylpyrrolidone (NMP: 10 ) prepared positive electrode slurry. The positive electrode current collector to a thickness of 30 μ m stainless steel mesh, stainless steel passivation without the positive electrode slurry was coated on the positive electrode current collector, a positive electrode dried for 24 hours in air at 110 ° C. Battery negative collector foil thickness ΙΟμηι. An electrolyte containing a concentration of lmol / L aqueous solution of lithium acetate and 1.5mol / L of zinc acetate, to the electrolytic solution by titration of 0. lmol / L lithium hydroxide and O.lmol / LHAc pH of the electrolyte is adjusted to 4 . Glass mat separator is a fabric. The positive and negative electrodes into a battery assembly, an intermediate separator spaced to inject an electrolyte. Good After standing 12 hours to be then assembled battery begins to 0.5C charge and discharge rate. Charge and discharge voltage range of 1.5-2. IV. FIG 17 is a discharge capacity of the battery provided in embodiment 3-4 and the embodiment of the relationship between the number of cycles of the curve. Can be clearly seen from the figure: initial discharge capacity of the battery, the discharge capacity after 250 cycles to the initial discharge capacity is almost no difference, showed very stable cycling performance of the battery, the present invention provides a battery having excellent electrochemical properties. In LiMn 2 0 4 as a positive electrode active material, the positive electrode active material according to 90%, 6% conductive carbon black, binder SBR (styrene butadiene rubber milk) 2%, by coverlet agent CMC (sodium carboxymethyl cellulose) 2% ratio, the first amount of water mixed with CMC uniformly, added positive electrode active material and conductive carbon black, stirred for 2 hours, and finally stirred for 10 minutes to obtain SBR added positive electrode slurry. The positive electrode current collector to a thickness of 0.1mm graphite foil, the positive electrode slurry was coated on a positive electrode collector, a thickness of 0.3mm, 120 degrees, after drying 12 hours a positive electrode sheet. Battery anode current collector to a thickness of 0.1mm graphite foil. The powder activated carbon (coconut shell firing, the specific surface area of 1500 m 2 / g), conductive carbon black, PVDF of 90: 5: 5 ratio mixed, NMP was added and dissolved, the negative electrode current collector were coated graphite obtain a porous layer on the foil, with a thickness of 0.1mm. Electrolyte solution is an aqueous solution containing a concentration of 4mol / L zinc chloride, and 3mol / L lithium chloride, a diaphragm separator is a nonwoven fabric. The positive electrode sheet, negative electrode sheet is assembled into a battery, in the middle of the diaphragm spaced. Injection of the electrolyte, an electrolyte stored in the most porous layer, the electrolyte during the charging and discharging of the Zn 2+ / Zn in the reduction of negative electrodes - inside the porous layer and a porous layer and the anode dissolution reaction, in particular - the deposition and oxidation deposition and oxidation - - dissolution reaction of reduction takes place at the interface between the current collector. FIG 18 a schematic view of the current collector surface of the anode structure forming a porous layer of the present invention. During charging and discharging, the negative electrode zinc deposition / dissolution. Micron pore activated carbon can effectively absorb large amounts of Zn in electrolytic solution and provide a base point. FIG 19 is a partial enlarged view of FIG porous layer 18, reactive ion deposition is apparent in layer 26 is deposited inside the porous layer. Good After standing 12 hours to be then assembled battery begins charging and discharging rate of 1C. Discharge voltage interval 1.4-2.15V (i.e. constant current lOOmAh charged to 2.15V, and then constant current discharge to 1.4V, so the cycle operation). LiMn embodiment of the present invention FIG 20 Example 4-1 2 0 4 / Zn battery first charge-discharge voltage - capacity curve of FIG. Manufacturing a battery in the same manner as in Example 4-1, except that a tin foil as a negative electrode current collector of the battery. Relatively graphite foil, a copper foil better conductivity, higher mechanical strength, is also thinner. Using the volumetric energy density of the copper foil negative discharge will help improve the performance of the battery, while also reducing the volume of the battery, improve the battery. But not a simple ion exchange copper foil negative electrode of the battery, since the copper foil surface, inefficient deposition of zinc. Thus, a layer of tin plating the copper foil surface, in order to improve deposition efficiency. The negative electrode current collector itself does not greatly affect the performance of the battery, in this embodiment, the battery charge and discharge curves made with a substantially similar embodiment. Manufacturing a battery in the same manner as in Example 4-1, except that a commercially available activated carbon fiber cloth as a battery porous layer. The microstructure is similar to activated carbon and activated carbon cloth, a thickness (uncompressed) of about 0.5mm, compressed between 0.1 -0.2mm. The specific surface area of the activated carbon fiber cloth was 800m 2 / g. The activated carbon fiber cloth and the negative electrode current collector cut into the same size, in accordance with the anode current collector - activated carbon fiber fabrics - nonwoven separator - positive electrode are overlapped. The same battery structure 15 shown in FIG cell structure thus formed, except that the material comprises a porous layer of activated carbon fiber cloth. Obviously, the above method of manufacturing a simple structure of the battery can be industrially produced at a faster rate. As the porous layer composed of activated carbon and the first embodiment mentioned in the second embodiment, the activated carbon fiber cloth can also provide a sufficiently large surface area of ​​the negative electrode. In LiMn 2 0 4 as a positive electrode active material, the positive electrode active material according to, activated carbon black, and PVDF binder weight ratio of 8: 1: 1 mixed uniformly, was cut into 12mm, a thickness of 0.1-0.2mm diameter discs of pressed aluminum the alloy current collector, a positive electrode made. The negative electrode is a diameter of 12mm, a thickness of lmm of zinc metal, zinc metal serves as an anode active material and the negative electrode current collector. N, the interval between the negative electrode 5mm, membrane filter paper. Electrolyte solution containing lithium ions and 4mol L 2mol L mixed aqueous solution of zinc sulfate and lithium sulfate / / zinc ion, adjusting the pH of the electrolytic solution by titration addition of 0. lmol / L of LiOH 5. The battery charge and discharge voltage range of 1.4-2.4V, a scan rate of 0.5mV / s. 2.4V when the positive electrode aluminum current collector surface passivation film is formed at a high voltage. Example 5-2, the thickness of the positive electrode current collector is aluminum alloy foil 50μηι, the thickness of the negative electrode is zinc 50μηι metal foil, an electrolytic solution is 1.5mol / L Zn (Ac) 2 and 2mol / L LiAc, fabric separator is a glass mat , and the composition of the remaining cells with the test method in Example 5-1. 21 and 22 are a graph showing CV embodiment Examples 5-1 and 5-2 battery provided. As can be seen from the figure, the anode and cathode each scan corresponds with two significant oxidation peak (1.95V and 1.85 V) and two reduction peaks (1.85 V and 1.7V), which is an organic electrolyte lithium ions prolapse / embedding mechanism coincide. In addition to these two distinct redox addition, the cycle time is also small oxidation peak appeared, 1.6V peak current occurs, this may be a cause of oxidation peak proton prolapse - embedding. This result further validates the good stability of the battery of the present invention and having excellent charge-discharge cycle performance. Further, after the cycle coulombic efficiency of Example 5-2 600 cells embodiment still nearly 90%, indicating a high charge-discharge efficiency of the cell. Example 5-3, the positive electrode current collector is passivated 304 stainless steel, 304 stainless steel of a thickness 50μηι, the electrolytic solution of 2mol / L ZnS0 4 and 2mol / L Li 2 S0 4, the separator is a glass veil, the remaining cells the same composition as Example 5-1, charge and discharge voltage range of 1.4-2. IV. DETAILED passivating stainless steel is: at 50 ° C, placed in stainless steel up to 20% concentrated nitric acid and a half hours to form a surface passivation film of stainless steel. FIG 23 is a CV curve of the battery in Example 5-3 embodiment. Example 5-4, the positive electrode current collector is passivated 304 stainless steel, the electrolytic solution of 3mol / L Zn (N0 3) 2 and 6mol / L LiN0 3, the battery remaining the same composition as in Example 5-1, charge and discharge voltage range is 1.4-2.2V. DETAILED passivating stainless steel same as in Example 5-3. FIG 24 is a battery in the embodiment 5-4 CV curve. Manufactured in the same manner as in Example 5-1 cells except through the thickness 304 is passivated stainless steel instead of 1mm graphite foil as a positive electrode current collector, particularly as the passivation process: at 50 ° C, stainless steel into a 20% nitric acid up to half an hour, the surface of stainless steel to form a passivation film. Electrolyte solution is an aqueous solution containing a concentration of 1.5mol / L zinc acetate and 3mol / L lithium acetate. Zinc battery anode is a metal. Stand for 12 hours after the battery assembly to be good, then began to 1mA constant current charging and discharging the battery. Charge and discharge voltage range of 1.4-2.2V. Manufacturing a battery in the same manner as in Example 5-1, except that 316 stainless steel is passivated 304 stainless steel instead of as a positive electrode current collector, particularly a passivation process described in Example 5-5. Stand for 12 hours after the battery assembly to be good, then began at a constant current of 1mA 3mA and battery charging and discharging. Charge and discharge voltage range of 1.4-2.2V. FIG 25 is a CV curve of the battery in Example 5-6 embodiment. Manufacturing a battery in the same manner as in Example 5-6, except that the electrolyte is an aqueous solution having a concentration of 3 mol / L zinc sulfate and 3 mol / L of lithium sulfate. Stand for 12 hours after the battery assembly to be good, then began respectively lmA, 2mA, a constant current of 3mA for the battery charging and discharging. Charge and discharge voltage range of 1.4-2.2V. Manufacturing a battery in the same manner as in Example 5-7, except that aluminum passivation is treated as a positive electrode current collector. Process for the passivation of aluminum: stand for 12 hours after the battery assembly to be good, then a constant current of 1 mA begins to charge and discharge the battery, the charging voltage are charged to 2.4V, i.e. the charge and discharge voltage range of 1.4-2.4V, aluminum metal surface to form a passivation film. 5-1 through 5-8 to the embodiment of the battery charging and discharging operations, cycle performance of the battery is detected. As can be seen from Table 2, when the cell performance after passivation treatment of stainless steel as a positive electrode current collector from both the capacity retention ratio and are more excellent in charge-discharge efficiency. Example 5-6 3mA at a constant current charge-discharge test, the capacity retention after the 80th cycle was 94%, the charge-discharge efficiency was 98%, the cell performance is superior to 1 mA constant current charge-discharge test results, the present invention is described battery having excellent battery performance at a high current. Example 5-7 In 2mA, 3 mA constant current charge-discharge testing of the embodiments, the cycle 80 times the capacity retention rate was 92% and 72%, respectively, charge and discharge efficiency was 99%, the battery provided in the embodiment to embodiment 5-7 battery performance 2mA galvanostatic charge-discharge best. In LiMn 2 0 4 as a positive electrode active material, the positive electrode active material according to, activated carbon black, and PVDF binder weight ratio of 8: 1: 1 were mixed, coated on a current collector passivated stainless steel, a positive electrode made. Stainless steel passivation method as in Example 5-3. 50μηι thickness of the negative electrode is metallic zinc foil, zinc serves as the anode active material and the negative electrode current collector. Glass mat separator is a fabric. Electrolyte solution containing a 2mol / L lithium acetate, mixed aqueous solution of 1 .5mol / L zinc acetate and 1 mol / L ¾ zinc, electrolytic solution adjusted to pH 5. The battery charge and discharge voltage range of 1 .4-2. IV, a scan rate of 0.5mV / s.
FIG 26 is a CV curve, the experimental results in Example 5-9 provided in the battery of the embodiment show, the coulombic efficiency of the battery 200 cycles of approximately 100%, indicating that the mixed salt electrolyte cell having a stable charge-discharge performance. In LiMn 2 0 4 as a positive electrode active material, positive electrode active material, super-p carbon black, PVDF binder in a weight ratio of 83: 10: 7 homogeneously mixed in NMP as a dispersing agent, to prepare a positive electrode slurry was evenly coated coated on the positive electrode current collector foil thickness 80μηι graphite, followed by drying and pressing to obtain a positive electrode. The thickness of the negative electrode is metallic zinc foil 50μηι, both metallic zinc anode active material, a negative electrode current collector also cater. Glass mat separator is a fabric. Deionized water containing electrolyte is 3mol / L of lithium chloride and a 4 mol / L zinc chloride, added dropwise through the electrolyte to the 0. 1 mol / L LiOH solution was adjusted to pH 4 electrolytic solution. At room temperature, the voltage range 1 .5 -2. 1 V to 4C battery charge and discharge rate. FIG 27 is a battery in the embodiment 6-1 the first embodiment and the charge-discharge curve of voltage, the battery can be seen from FIG initial discharge capacity of about 0.35mAh. FIG 28 is a battery discharge capacity curve of the relationship between number of cycles, the battery remains above 85% in battery capacity after 1000 cycles, the capacity decay is small, indicating that the battery has a very good stability. FIG 29 is a battery coulombic efficiency versus cycle number, and the battery can be seen from FIG coulombic efficiency after 1000 cycles of 80% or more. In LiMn 2 0 4 as a positive electrode active material, positive electrode active material, super-p carbon black, PVDF binder in a weight ratio of 83: 10: 7 homogeneously mixed in NMP as a dispersing agent, to prepare a positive electrode slurry was evenly coated coated on the positive electrode current collector foil thickness 80μηι graphite, followed by drying and pressing to obtain a positive electrode. The thickness of the negative electrode is metallic zinc foil 50μηι, both metallic zinc anode active material, a negative electrode current collector also cater. Separator is a nonwoven fabric. Electrolyte solution is an aqueous solution containing 3mol / L lithium chloride and 4mol / L zinc chloride, pH adjustment of the electrolytic solution by the dropwise addition of 0. 1 mol / L solution of LiOH in the electrolyte is 4. At room temperature, the voltage range 1 .5 -2. 1 V at 1 C rate for charging and discharging the battery. Battery discharge capacity versus cycle number in FIG. 30 is provided in the embodiment 6-2, a slight attenuation battery capacity after 30 cycles, but the rate of decay is very slow. FIG 31 is a battery coulombic efficiency versus cycle number, the coulombic efficiency of the battery after 30 cycles of almost 90%. In LiMn 2 0 4 as a positive electrode active material, positive electrode active material, super-p carbon black, CMC-SBR adhesive in a weight ratio of 83: 10: 7 mixed to NMP as a dispersing agent, to prepare positive electrode slurry, They are coated on the positive electrode current collector foil thickness 50μηι stainless steel, and stainless steel is not passivated, followed by drying and pressing to obtain a positive electrode. The thickness of the negative electrode is metallic zinc foil 40μηι, both metallic zinc anode active material, a negative electrode current collector also cater. Glass mat separator is a fabric. Electrolyte solution is an aqueous solution containing l mol / L lithium acetate and 1 .5mol / L zinc acetate by dropwise addition of 0. 1 mol to the electrolyte / L of LiOH and 0. 1 mol / L HAc solution to adjust the pH of the electrolyte 4. At room temperature, the voltage range 1 .5 -2. IV at 0.5C charge and discharge rate of the battery. Battery Example 6-3 show the experimental results, the cycle discharge capacity retention ratio of the battery 320 times and coulombic efficiency was close to 100%, indicating that the battery has a very excellent performance and cycle life. In Example 6-4, a battery in charge and discharge at 55 ° C, in order to study the battery charge-discharge characteristics at high temperatures, as well as other components of the battery testing method with Example 6-3. FIG 32 is a battery provided in embodiment 6-4 and the embodiment of the discharge capacity versus cycle number, it can be seen from the figure, the battery temperature at 55 ° C for still having good discharge capacity retention ratio, is almost 160 times the battery cycle no obvious capacity fade. In LiMn 2 0 4 as a positive electrode active material, positive electrode active material, super-p carbon black, PVDF binder in a weight ratio of 83: 10: 7 homogeneously mixed in NMP as a dispersing agent, to prepare a positive electrode slurry was evenly coated the thickness of the positive electrode current collector coated 30μηι fluid stainless steel mesh, stainless steel is not passivated, followed by drying and pressing to obtain a positive electrode. The thickness of the negative electrode is metallic zinc foil Ι Ομηι, both metallic zinc anode active material, a negative electrode current collector also cater. Glass mat separator is a fabric. Electrolyte solution is an aqueous solution containing l mol / L lithium acetate and 1 .5mol / L of zinc acetate, by dropwise addition to the electrolyte 0. l mol / L of LiOH and 0. 1 mol / L HAc solution to adjust the pH of the electrolyte 4. At room temperature, the voltage range 1 .5 -2. IV at 0.5C charge and discharge rate of the battery. FIG 33 is a graph showing the relationship between discharge capacity and number of cycles of a battery provided in embodiment 6-5 embodiment, it can be seen from the figure, the battery discharge capacity after 30 cycles with little attenuation, the present invention provides that the battery charge and discharge stability good performance . In LiMn 2 0 4 as a positive electrode active material, positive electrode active material, super-p carbon black, PVDF binder in a weight ratio of 8: 1: mixed, NMP as a dispersant to prepare a positive electrode slurry was uniformly coated on the positive electrode current collector foil thickness 80μηι graphite, followed by drying and pressing to obtain a positive electrode. 50μηι negative electrode current collector to a thickness of the graphite foil, metallic zinc plated onto the graphite foil as a negative electrode active material. Glass mat separator is a fabric. Electrolyte solution is an aqueous solution containing a 2mol / L lithium acetate and 1 .5mol / L zinc acetate by dropwise addition of 0. 1 mol to the electrolyte / L LiOH solution was adjusted to pH 4 electrolytic solution. At room temperature, the voltage range 1 .5-2. IV at 0.5 C rate charging and discharging the battery. Manufacturing a battery in the same manner as in Example 7-1, except that the 316 stainless steel foil instead of graphite as a negative electrode current collector. In the same manner as in Example 7-1 for producing a battery, except that a copper foil as a negative electrode instead of the graphite foil current collector. Battery Example 7-1 to 7-3 provided in this embodiment, a battery having excellent cycle performance. Although the inventors have done a more detailed description and include technical solution of the present invention, it should be understood that the skilled person, modifications and / or adaptations of the embodiments described above or with equivalent alternatives will be apparent, are not departing from the true spirit of the present invention, the term appearing in the present invention for clarity and understanding of the technical solutions of the present invention and should not be construed as limiting the present invention. The negative electrode further comprises a negative electrode formed on the collector surface active material, the anode active material capable of being oxidized during discharge - dissolution of the active ion. 2. The battery according to claim 1, wherein: said negative electrode active material formed on the negative electrode current collector by coating, plating or sputtering. 3. The battery according to claim 1, wherein: said negative electrode active material comprising at least one elemental metal, the metal is selected from Zn, Fe, Cr, Cu, Mn, Ni in. 4. The battery according to claim 1, wherein: the material of the negative electrode current collector is selected from metal Ni, Cu, Ag, Pb, Sn, Fe, Al or one of the metal through the passivation treated . The battery according to claim 1, wherein: the negative electrode current collector material is selected from carbon-based materials, stainless steel, silicon or a metal having plating / coating, the coating / coating contains C, Sn , a simple substance, an alloy, or an oxide in, Ag, Pb, Co is at least one. 6. A battery as claimed in claim 5, wherein: said plating thickness range in l / coating layer - between 1000nm. The battery according to claim 1, wherein: said negative electrode further comprises a porous layer formed on the anode current collector surface, the porous layer having micron or submicron or nano-sized pores. 8. The battery according to claim 7, wherein: said porous layer comprises a carbon-based material, the carbon-based material is selected from Ketjen black, active carbon, carbon nanotubes, carbon fiber, graphite, at least one kind. 9. The battery according to claim 7, wherein: said porous layer comprises a carbon-based material, the carbon-based material is a mixture of activated carbon powder and a binder, wherein the activated carbon powder comprises the weight percentage ranges from 20 to 99% of the porous layer. 10. The battery according to claim 1, wherein: said negative electrode further comprises a negative electrode formed on the surface of the graphene layer of the current collector. 1 battery according to claim 1, wherein: the negative electrode current collector is copper, said anode active material is zinc. 12. The battery according to claim 1, wherein: said negative electrode active material formed on the surface of the anode current collector after pretreatment, the surface pretreatment is selected from mechanical, chemical or electrochemical treatment, at least one kind. 13. The battery according to claim 1, wherein: said electrolytic solution pH in the range 3-7. 14. The battery according to claim 1, wherein: the active ions are present in at least one form chlorate, sulfate, nitrate, acetate, formate, phosphate in the electrolyte. 15. A battery according to claim 1, wherein: the positive electrode active material capable of reversibly prolapse - lithium ions, sodium ions, magnesium ions or zinc ions. 16. The battery according to claim 1, wherein: the positive electrode current collector material is selected from graphite, stainless steel, aluminum, stainless steel or passivated aluminum.